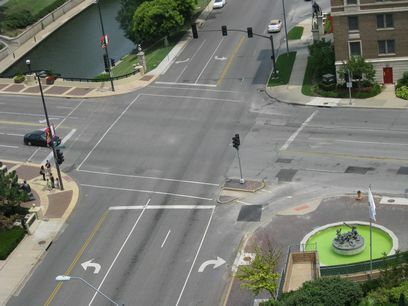 If, like me, your idea of a city is a high-density urban experience like New York or Boston, Kansas City's Country Club Plaza is something of a surprise. Fairly spread out, with the kind of wide streets, room between buildings and parking that you'd rarely see in a major city in the Northeast, I didn't need the shopping area's brochure to see that it was designed with the automobile in mind. Still, though, there's some interesting architecture, and it's a much more walkable environment than, say, Route 9. In fact, the Plaza was an early version of what seems to be all the rage these days -- so-called outdoor "lifestyle centers" that replace the indoor sterile environment of a mall with an outdoor experience aimed at creating more of a sense of place. I did in fact find Country Club Plaza a more pleasing experience than a mall. The fountains were lovely, and being able to walk around outside was a plus (well, except for the day it was 98 degrees). There seemed to be a decent amount of bus service to and from the area, and there appeared to be a fair number of apartments as well as hotels right within walking distance. The parking was very well screened, unlike many such developments. This would be a great model for a reasonably densely populated suburb. How cool would it have been if the Natick Mall or Shoppers World could have looked something like this, instead of a) an indoor mall totally cut off, walkability-wise, from the surrounding community; or a poorly designed outdoor mall that's so pedestrian-hostile people feel the need to drive from one end to the other. 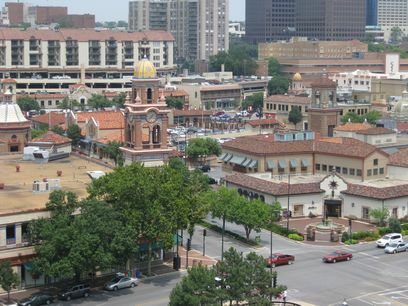 However, as an urban project, Country Club Plaza has a lot of disappointments. I realize much retail these days is nation-wide chains, but the dearth of local stores and restaurants (a few, but grossly outnumbered) was disappointing. It's hard to keep a sense of place when 90%+ of the retail offerings could be seen in AnyMall, USA. Also, it was really odd to see so few people out walking around except during limited retail hours. I went for a walk in the morning, around breakfast time, and the streets were so deserted as to be a bit creepy. With all the residences nearby, it would have been nice if there were some destinations for off hours, too, such as breakfast cafes with outdoor seating (all I saw was a lone Starbucks amidst blocks of closed stores). Finally, the emphasis on automobiles made a few of the intersections a bit off-putting for walkers. Intersections this wide could use a redesign, an attractive divider, or something to break up the asphalt ocean.